If you love to cook, BlueStar appliances is the right match for you. Made in the USA in their Reading, Pennsylvania factory since 1880, the brand showcases some cutting-edge appliances. Their mantra "unleash your inner chef," tells it all. 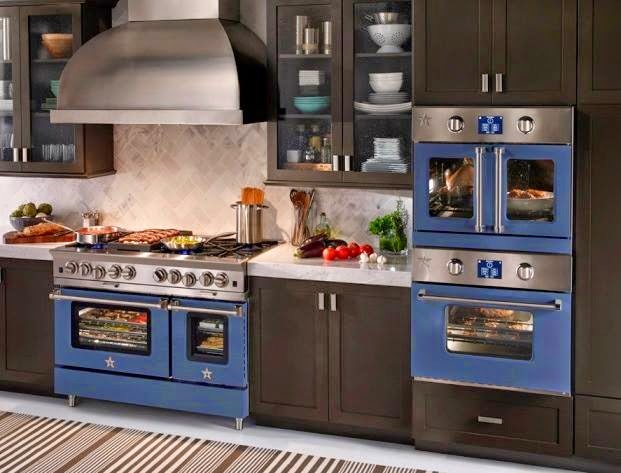 The cooking products ( gas ranges, cooktops, wall ovens and hoods) are designed for the keen home chef who demands restaurant quality results in their own kitchens. Besides top notch performance, appliances are customizable. I'm loving this blue color which I saw at the Architectural Digest 2015 Home show but there are over 750 colors, finishes to choose from and infinite configuration possibilities. A clients dream who wants to customize their kitchen. I am obsessing over their new 36" Built-in refrigerator. 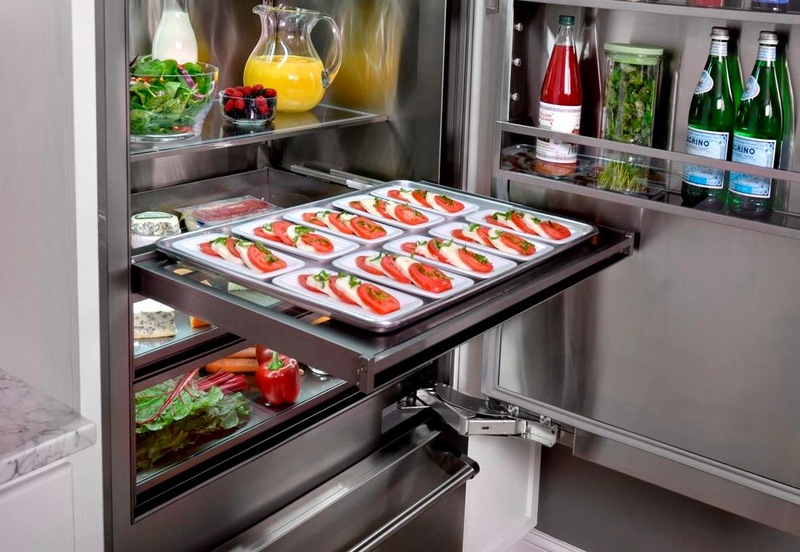 It accommodates full size baking sheets into the refrigerator and freezer. I have not seen that before. Innovative thinking for someone who entertains a lot! 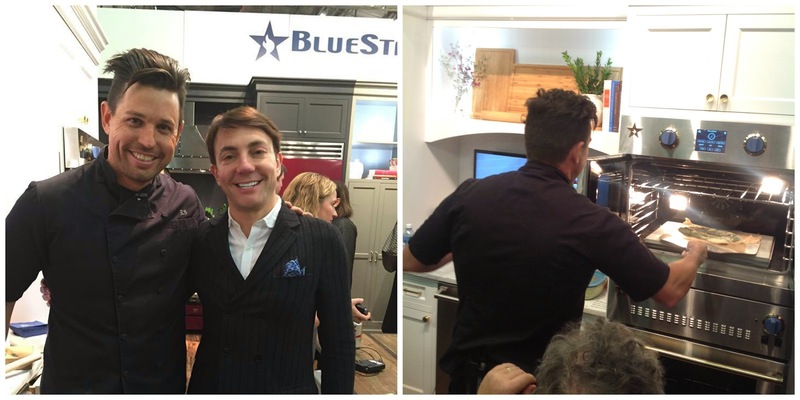 Renown NYC Interior Designer Eric Cohler popped into BlueStar's booth at the show while tasting some of Chef Ryan Scott's delicious Spring Pea Hummus with Rosemary and Sea Salt Crusted Bread. Eric announced BlueStar's first annual Kitchen Design competition to honor design professionals who incorporate BlueStar products into innovative, beautiful kitchens. Eric will be one of the judges. Very exciting! 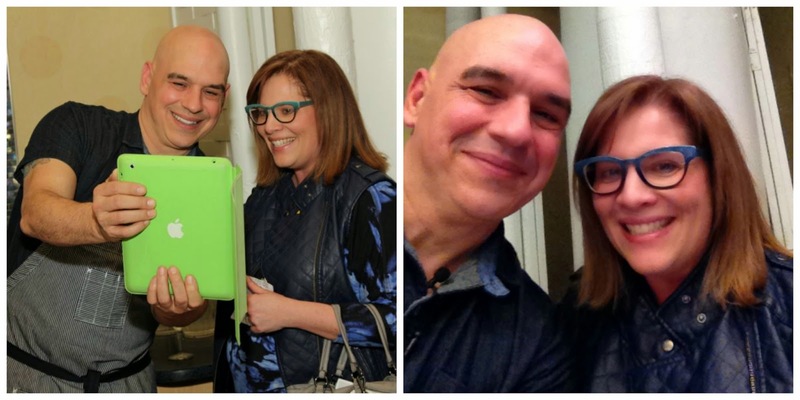 The best moment of the day was attending a special media event with Chef Michael Symon hosted by BlueStar at ICE (Institute of Culinary Eductaion) in NYC. It was fun, interactive and I was so happy to actually meet the Chef. He is as approachable and funny as he is on TV. At the event, Michael shared new spring entertaining recipes where he said he loves family style and breaking bread with people. I sat at a round table of people who I got to know and shared some amazing food like Spring Pea Crostini, Cavatellii with Lemon Butter and Sage and Roasted 1/2 Chicken with Shaved asparagus Salad. Chef Michael explained that when you make pasta your water should taste like the sea! A pinch of salt is not enough! I was shocked by how much salt he put in that boiling pot of water, no joke! He said his grandmother taught him that you should be flavoring the water and not the sauce. That's the difference between an OK cook and a great cook. I loved the Cavatelli with Lemon Butter and Sage and its so easy to make. Place a large saute pan over medium heat and add butter. Add the sage and season with salt and pepper. Continue to cook until the sage and the pasta are crisp then then add the lemon juice. Stir to combine then remove from the heat and stir in the parmesan. Lucky me, I was sent home from the event with a copy of his new cook book 5 in 5. Yep, 5 ingredients to make some awesome meals at home to share with your family. 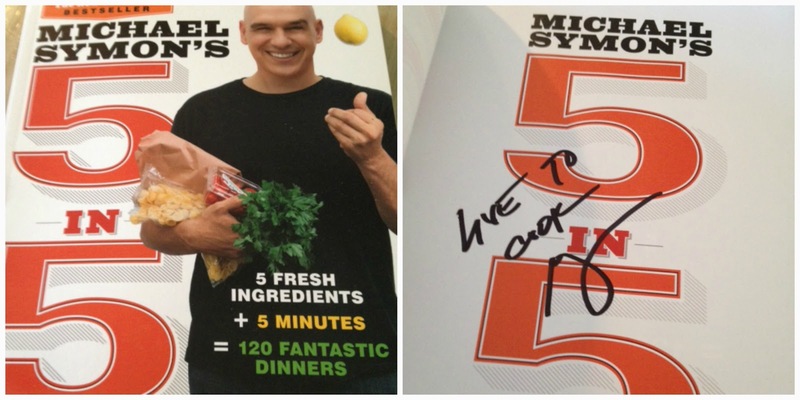 He signed in the inside cover saying "Live to cook." Loving food as I do, not a problem!